Those of us who have dealt with Alzheimer’s in our families know just how particularly cruel this disease can be. Much of that has to do with the loss of the person, their personality and memories. They become a shell of the person they were and it can be difficult for family members to adjust. This thoughtful blog post below highlights the benefits of living in the present, as so many people with dementia do. A Twitter thread by a pediatrician has been making the rounds lately, and for good reason. Dr. Alastair McAlpine asked some of his terminal pediatric palliative care patients what has mattered the most to them in life, and what has given their lives the most meaning. The children’s answers are both simple and profound, and something we adults should take to heart. The things so many of us are hooked on, such as television or social media, did not make the kids’ important list. Family, pets, books and ice cream did rank high. These young souls whose lives will most likely be cut short barring a medical miracle shared a couple of values they found to be the most important. Kindness and a sense of humor made the list, not wealth or celebrity. I encourage you to read the short thread on Twitter. At the end, Dr. McAlpine offers a takeaway for all of us. These are the things these kids wished they could've done more. The rest is details. We could all use a reminder to let go of negative thoughts and regrets and focus on the truly important people and things in our lives. At the very least, we can commit to enjoying more ice cream. It started out with good intentions. Facebook created a feature called “On this Day” that reminds users what they had posted a year ago, two years ago, etc. The prior year posts are flagged in your newsfeed, and you can choose whether to share them with your friends or keep it private. While no doubt the idea was to remind people of happy memories, such as births, weddings and family vacations, for some of us, our Facebook timelines are filled with depressing posts. 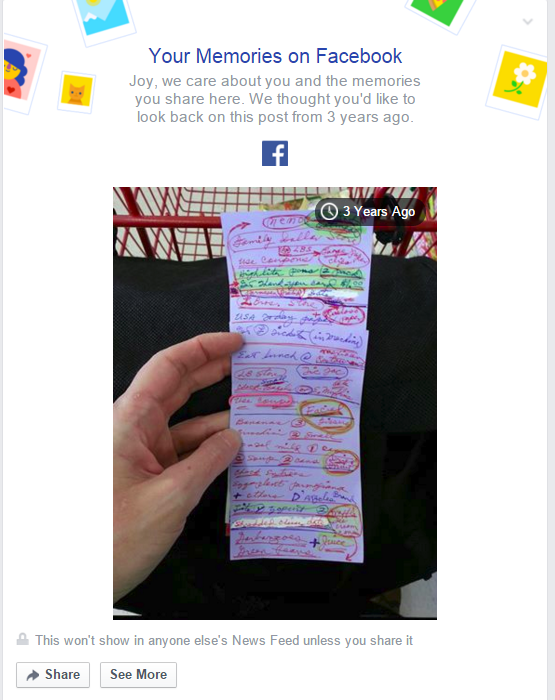 A Facebook “On this Day” moment capturing my mom’s crazy shopping list. If you are a long-term family caregiver, your timeline may look more like a roller coaster of memories, with good, bad and the ugly all present. I’ve ran into a few issues with prior posts that brought up memories of my mother, and that summer of 2012 when she was recovering from cancer. There have also been some “On this Day” posts featuring departed pets. Not always the thing you want to greet you as you start your day. Being on Facebook is a part of my job so I cannot simply ignore it. As it turns out, other Facebook users were also having a bittersweet experience with this new feature, so now there is a filter option. Users can filter out names and/or periods of time to skip over painful memories like deaths and divorces. If only it were that easy to filter out bad memories in real life. Still, I believe that the ups and downs of life are all part of the experience of being a human being. While I am glad Facebook added the filter feature, I haven’t actually used it yet. If I was strong enough to survive the actual experience, I can also survive the memories. Today is my birthday, and I have to say I don’t mind being a year older. At least it offers me a symbolic new start, as 40 was one of the most difficult years of my life. I’m having a lovely time in the mountains, but there is of course one thing missing. As I’ve mentioned previously on this blog, my parents always made a big production out of singing “Happy Birthday” to me over the phone. I have a poor recording of Mom singing “Happy Birthday” to me last year, recorded from my cellphone. It’s only barely listenable, but I’m glad I have it. I do have a good video and audio version of my parents singing “Happy Birthday” to me, but sadly, it was when Dad was rapidly declining in the care facility. The staff had him so drugged up that he could barely stay awake, and he mumbled through the song. Mom tried to compensate by being overly cheery, but I know her heart was breaking inside. Just the year before, Dad belted out the best version ever, and even sang another classic crooner song. That is the recording I wish I had. While I sometimes feel that in today’s world, people are so busy recording their lives to post on social media that they forget to be in the moment, the upside is that they will have all of the moments recorded to cherish later. So my birthday wish is for everyone to experience and if so desired, record loving moments with their family. It truly is something we often take for granted, until the opportunities no longer exist. Today I want to highlight a nonprofit organization that I just stumbled upon. They’ve been around since 2009, so many of you may be familiar with them, but I wasn’t. The group is called The Spaces Between Your Fingers Project and the group writes memory snapshots for people with Alzheimer’s that are recorded on postcards and sent to families. The service is free, and a copy of the memory postcard is kept in the Free Library of Philadelphia for archiving purposes. The organization has collaborated with the Alzheimer’s Association in the past. The group also has set up an online tool that allows anyone to record a memory postcard, whether they have dementia or not. I love this concept, it is so unique and is a great way to encourage people to record family memories. 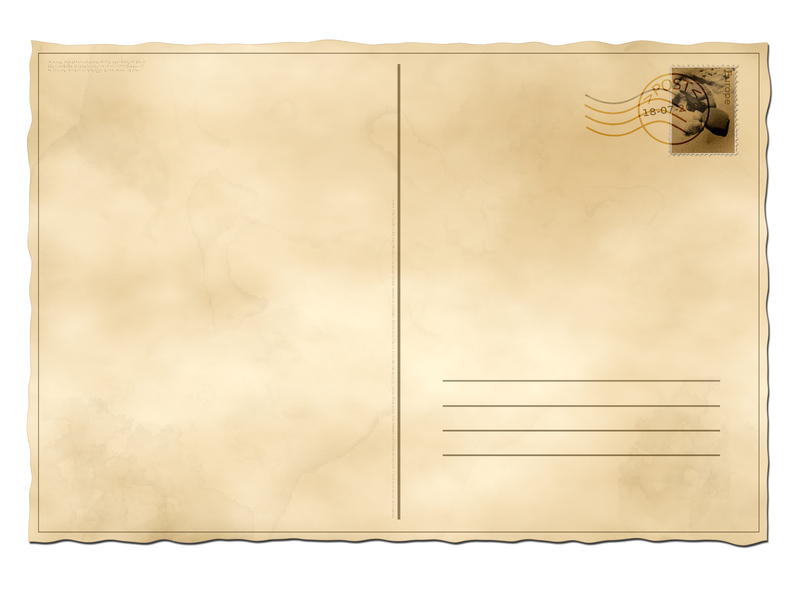 If you are wondering what “the space between your fingers” means, there is a lovely storybook on their site that takes you through the very touching tale inspired by the founder’s grandfather. You may look at Alzheimer’s in a whole new light. I plan on giving the service a try soon and will share what I create. What is the first memory from your life that you would want to preserve? 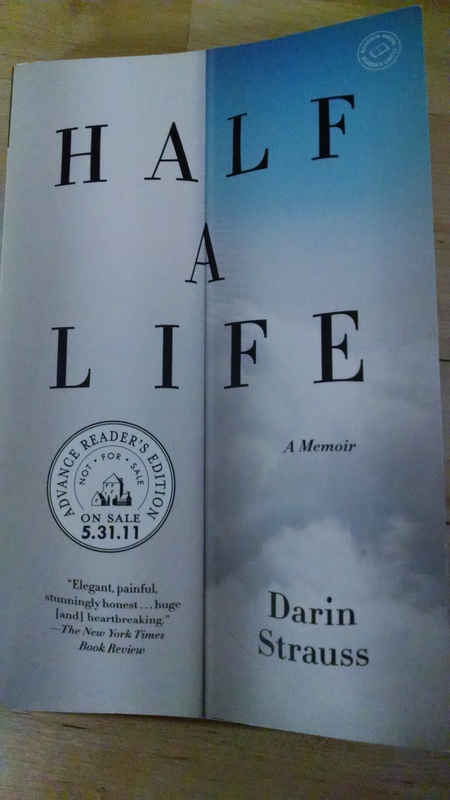 A memoir that relies heavily upon the memories of a single life-changing event is “Half a Life” by Darin Strauss. I’m sure you’ve read many stories about a tragic car accident that claims the life of an innocent person. While often alcohol and drugs are involved, sometimes these events are truly accidents, with no direct fault assigned to the person behind the wheel. Have you ever wondered what happens to these people? To know, even if you weren’t directly at fault, that your actions claimed the life of another human being … how would you manage to go on with your life carrying that memory? Well, author Darin Strauss knows, because he was the person behind the wheel of the car that struck and killed a classmate who was riding a bicycle. Strauss had just turned 18, and perhaps the inattention and inexperience of a young driver played roles in the accident. Still, no charges were ever filed and his community, even the deceased classmate’s parents seemed to forgive Strauss. But then the grieving parents decided to sue Strauss for millions of dollars, and the case dragged on for several years, thwarting Strauss from moving on with his life. Even though he saw a therapist, he never worked through his guilt and other feelings surrounding the tragedy. He did what many of us try to do during difficult situations: he put a smile on his face and carried on, suppressing his emotions. The memory of the accident haunts all facets of his life, from work to friendships to the dating scene. Not only do the lingering memories of the accident have a negative impact on his emotional well-being, they physically make him ill and he has to have stomach surgery before turning 30. Finally, as he marries and becomes a father, he decides to engage in the best therapy of all for a writer: he would write about the experience in a memoir. The result is a powerful work, and a lesson for all of us trying to process difficult memories. I was very moved by this book and highly recommend it. I want to focus the rest of my January posts on the power that learning of other people’s memories have on us. Over my next posts, I will highlight some of my favorite memoirs, and the vivid memories that really stuck with me long after I finished the book. This time around, I want to talk about the essay featured in the current issue of The Atlantic titled, Surviving Anxiety. It is written by the magazine’s editor, Scott Stossel. It is an excerpt from his upcoming book, which is now on my reading list. Scott suffers from severe anxiety and several different phobias. I don’t share his extreme level of anxiety, but I do share some of his phobias, like public speaking and vomiting (of which there is a related phobia that I also share, that being vomiting while flying.) He also suffers from digestive issues, which I can certainly sympathize with, as I have experienced numerous digestive issues mainly tied to my gluten intolerance. He writes a compelling and moving account of how these conditions have impacted his life, both negatively and positively. He talks about the pros and cons of the many treatment options he has endured. He bravely shares humiliating episodes where his anxiety or digestive problems rear their ugly heads. Scott shares a particularly embarrassing bathroom episode that occurred at the Kennedy compound. (The author was writing a book about one of the Kennedy family members and was spending some time there along with a mix of celebrities and dignitaries.) Scott feels his bowels betray him at the worst moment, when he is not near a public restroom. He runs back to the mansion, trying to avoid other guests and secret service members. He makes it to the restroom but then the worst case scenario happens: the toilet backs up and overflows. He is covered in sewage. Talk about bad timing: just across the hallway from the bathroom, guests are gathering for cocktail hour. Scott cleans up as best he can, then has to wrap a dirty towel around his waist (his pants were ruined) and sprint to his second-floor suite. He makes it, but not before encountering JFK Jr. That experience could make anyone with anxiety want to crawl under a rock and never come out. These memories are written in excruciating detail, with every anxious thought and feeling captured. They struck a chord with me and rolled around in my mind for the rest of the day. 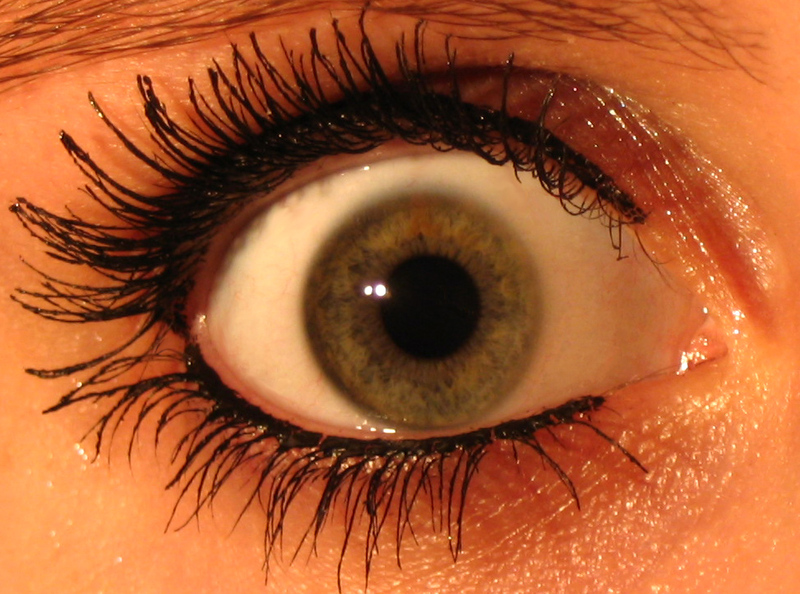 My takeaways: you never know what is really going on in someone’s head. (Obviously, as editor of a well-known magazine, Scott has been able to manage his anxiety to a certain extent and still be a successful person.) Also, all of these anxious thoughts and feelings and phobias sound crazy if you haven’t experienced them, but from the response the article has received, there are plenty of anxious people out there who completely understand. I am one of them. What memories from other people have had a meaningful impact on your life?